The Lower Owens has been nothing but good to us this January of 2019! Nymphing has been very steady nearly all days on the same usual winter patterns: (Tung Jig PT soft Hackle, Green Caddis, Midge Larvae..ect.) The flows continue to be around 100cfs give or take a dozen cfs. This, of course, leaves the entire river open to wading and access is at its best. The Baetis (BWO’S) are starting to make an appearance! In the last week we have had the pleasure off fishing dries for a good part of the day! This, as I have said before, only happens in certain parts of the river. One must find a slow moving foam line in deep enough water with adequate cover nearby. That is where you will find the risers at the moment. Soon, very soon this even should be river-wide… stay tuned! Some snow has arrived on the banks of the Upper Owens River making it even more of an amazing place to visit. The Big Trout are still there with newer prospects arriving and moving. Flow rates are at their usual winter levels with great to good visibility, depending on where you fish. 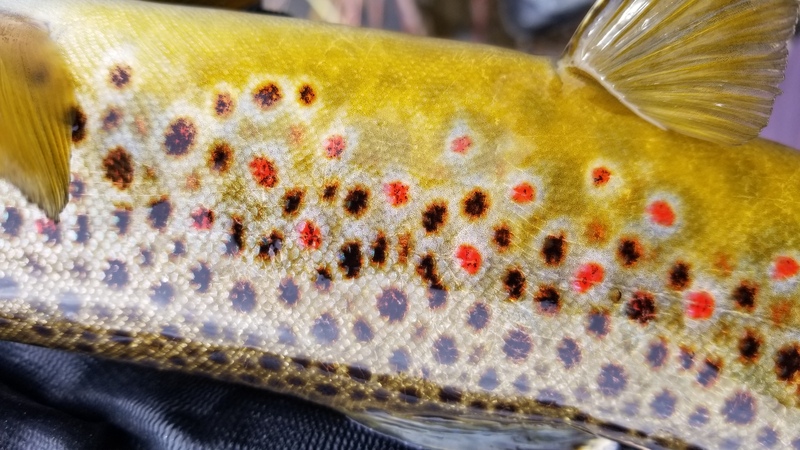 The Big and small flies have been tricking the large trout in 2019. Lots of attractors of various types: Hot Head leaches, Pistol petes, Sammy Juan worms, Copper Bobs and Jons, and other similar patterns, Midge patterns, Soft hackles, and some small Beadheads are flies to attach to you tippet. The snow is there but we are still able to drive in, those with a 2-wheel drive vehicles can park at the bridge and take an easy walk in. Streamers! Yes! A sinking tip or longer weighted leader on a standers floating line presented properly on some days seems to be the way to get one of these unforgettable fish into your net! The Upper Owens has been a consistent Big Trout Factory for the last couple of months! 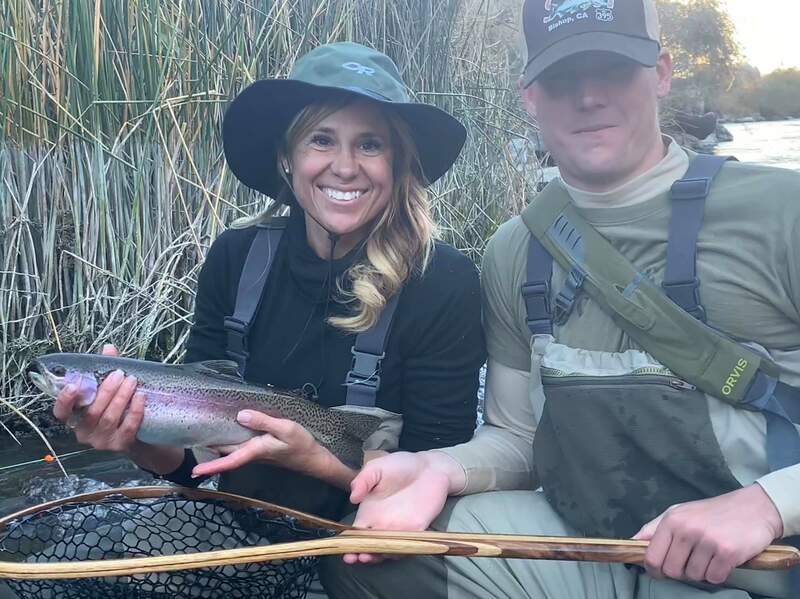 Awesomely wild and perfectly finned Rainbows, Cutt Bows, and Brown Trout will continue to be roaming the waters of the Upper Owens River for the next few months. The snow level has pretty much vanished at this point and needs no further attention. Of course upon arriving in the morning hours it is well below freezing on most days, this, of course adds to the experience as you take in the surroundings and realize what are special place you are able to visit to sample her amazing Trout. The same techniques and strategies hold as in my December post. Deep holes and riffly water erase the view from the surface which keeps these oversized beasts of the river hidden, feeling comfortable and safe, and ready to eat! All sorts of Tubifex worm patterns, Tung Jigs, and various attractor patterns in larger sizes will give you a shot at these unforgettable fish. Streamers are always an option here as well. This will keep you casting and strategizing all day on how to get one of these trophy Trout into your hands for just a moment…. 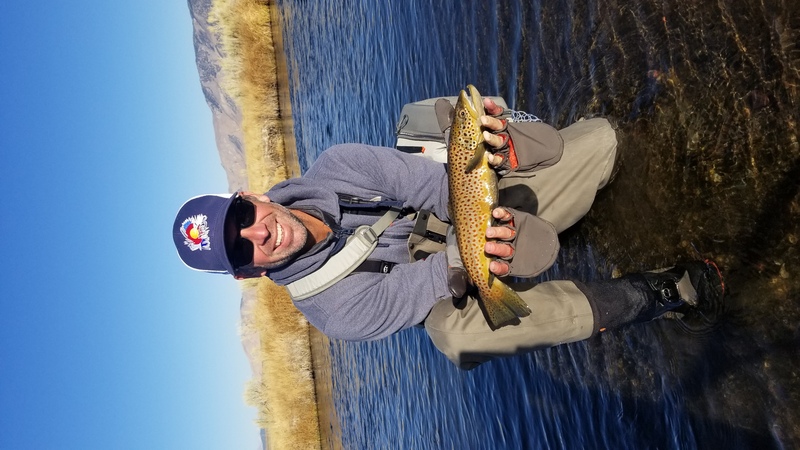 The Lower Owens fly fishing has been outstanding! Good numbers of fish as well as some large specimens have been coming out of the Lower O’s nutrient rich system. Some dry fly action is seen mid-day but can be short lived. Baetis, a small Mayfly can be seen hovering around the river and over the water around this time of the day. The nymphing turns out to be very good! The same patterns I have been going on about are still working very well. The green caddis worms also have their good days this time of the season. Flows are down to around 100-125cfs and wading is straightforward in the standard areas. The Lower Owens has dropped to a very popular flow of around 148cfs right outside of Bishop California. Wading is gentle, and the river is alive with action! BWO’s come off around 11-12:30 at a varied duration of time, Caddis can be seen flying acrobatically over the waters surface , and a healthy Midge population is around all day long. The main surface action occurs on the BWO’s also knows as Baetis or basically a small Mayfly around size #16-18. Nymphing and streamer activity has been very productive in between the dry fly session. Now is the time we have been waiting for to come to Bishop and fish the premier wild Brown Trout river of California, the Lower O! The Fly Fishing the Upper Owens down from Mammoth Lakes remains a seasonal and somewhat mythical fly fishing destination…. why you ask? BIG FISH! of many species… Although we have not had a fish driving hard storm yet we do have a good showing of over sized fish heading up the river in decent numbers. Flows are low and clear which is typical during the fall/winter fly fishing season on the Owens river system. Fish the places you would hide if you were a big aggressive fish looking to pass your genes on to the next generation! The fish have infiltrated the entire system so read the water correctly and appropriate your time in the fishiest spots. Fish the same flies as in my last report. SJ Worms of various styles, Coppers, PT’s, Hot Heads ect… Don’t be afraid to experiment with some similar patterns as well. Stop by or call the shop to get in on these world class fish that people usually have to travel far away to catch!